A good article from Reliable Plant newsletter in regards to Change. I have never been known to be musically inclined, but I can recognize a great song when I hear one. One of these great songs is “I Heard It through the Grapevine.” This particular song has been recorded and re-recorded numerous times over the years by many different artists, and although it may bring thoughts of animated raisins to people in my generation, it is more closely associated with Marvin Gaye. Just as the grapevine in this song had a strong impact, the communication grapevine remains an extremely powerful medium for corporate communications. The effectiveness of grapevine communication and its use – both intentional and unintentional – should not be ignored. When coaching clients during major change initiatives, we continuously stress the importance of effective communication. Experience has shown that clients who struggle to communicate also struggle to successfully implement major change. Even post-project analysis of very successful projects often finds the company could have communicated more frequently and effectively at some point in the project. One of the key success factors in successfully implementing a major change initiative is creating a comprehensive change-management strategy and then integrating it into the project-management plan. Creating a communication plan is one of the most critical elements contained within this change-management strategy. In this plan you identify target audiences, determine key messages, choose the preferred sender and select the appropriate communication channel for that message. The majority of communication channels typically chosen are formal communication channels. The communication channel that is often forgotten is the informal communication channel, and this brings us to the topic of the infamous grapevine. So what is the grapevine, how does it work and how can you use it to effectively communicate during major change? I am sure that the grapevine is as old as time itself, but I will discuss its context within modern organizations. Every organization has both an informal and formal organizational structure as well as formal and informal communications. Simply stated, the grapevine is a type of informal communication channel. It’s all about people communicating directly with other people outside official channels of communication. The laws of supply and demand apply equally to grapevine chatter and economics. An information void exists when the information demanded exceeds the information supplied. The supply and the demand of the information are not defined by the organization but by the individual person who desires the information. An information void will be filled with something – either rumors or valid information. The larger the information void, the greater the amount of chatter in the grapevine. What’s in it for me (WIIFM) seems to show up in many places when we are talking about organizational change. Regardless of the situation, when change occurs our natural tendency is to translate this into a WIIFM context. This is what you are listening for. How does this change affect me, my pay, my family, my free time, etc.? Whether that WIIFM is good or bad, it creates a vested interest. When people have a vested interest, they will want information. The greater the impact on WIIFM, the greater the amount of chatter on the grapevine. Many organizations are stunned at how breaking news hits the grapevine at breakneck speed. Even something as simple as an office remodeling (occurring in our offices right now) can generate significant grapevine chatter. The fresher the story, the greater the chatter on the grapevine. The impact of the WIIFM factor is exponentially compounded by the level of insecurity that exists. The greater the amount of insecurity that exists within the organization, the greater the amount of chatter that will exist on the grapevine. For example, with the current fragile state of the economy, one can easily see how this factor can become extremely high. 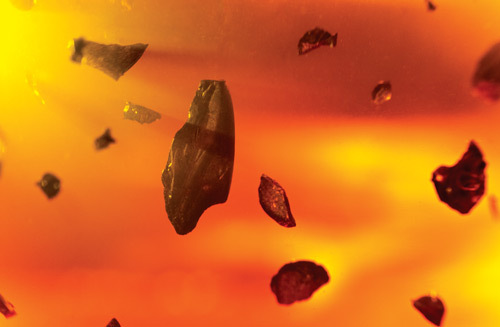 As stated earlier, an information void will be filled. When the desire for information is high and the number of facts that are known is low, the number of rumors flying is huge. Most of us have experienced this firsthand, and sometimes it is not a pretty sight. Regaining control of information in the midst of flying rumors is extremely difficult. The longer a rumor is allowed to fly, the more difficult it is to replace it with valid information. While some people try to fight rumor with rumor, the only effective way to combat rumor is with facts. When a large number of rumors exist, an even larger number of facts must be communicated to combat the rumors. Knowing the factors that make up grapevine chatter – information voids, WIIFM, recent news and insecurity – you can proactively intervene with frequent and effective communication. Fill information voids with accurate information before rumors materialize. Proactively communicate when breaking news is expected. When information (such as impending mergers and acquisitions) is about to be communicated, be prepared and react quickly after the message is released. When communicating change initiatives, ensure that you communicate the impact of the change on the individual. Addressing the factors associated with grapevine chatter can minimize but never totally eliminate the amount of informal communication occurring. However, by better understanding the grapevine, you can successfully leverage it as part of your overall communication strategy. One of the tenets of a good communication strategy is evaluating the effectiveness of your communication. This is accomplished by obtaining feedback. What better way to gather feedback than to take advantage of an existing channel of communication? Over the course of my career, I have been able to tap into the grapevine at your typical places — the water cooler (scuttlebutt in Navy terminology), the coffee pot and the smoke break area. Tapping into the grapevine is not normally achieved overnight. Grapevine communicators are a very selective bunch. They will not share all information with everyone. There must be some level of relationship and trust established, and building relationships and trust takes time. To accomplish this, you must get out of the office, talk to people and most of all listen. But while the traditional grapevine is thought of as being a face-to-face or oral type of communication, this is no longer the case. Advances in technology and recent trends in social networking have significantly transformed the modern grapevine. Informal communication now occurs through email, texting, Twitter and on social-networking sites such as Facebook. Implementing major change in an organization is a complex and challenging task. In the end, creating organizational change is about cumulatively creating change in individuals. Successfully leading major change requires successfully leading individuals. To successfully lead individuals through change, you must be able to communicate effectively. You must find new ways to connect to people and communicate in every imaginable way. That includes tapping into the grapevine. Without it, you just might lose your mind. Honey, honey, yeah. Dave Berube, a senior consultant for Life Cycle Engineering (LCE), has more than 30 years of experience in leadership and management. His expertise includes behavioral change management, project management and development, and process improvement within various types of organizations. You can reach Dave at dberube@LCE.com. In the field of tribology, the word “particles” means different things to different people. The following case studies illustrate how differently the mechanical engineer, tribologist, sampler, analyst and diagnostician interpret the presence of particles. To the mechanical engineer and tribologist, the presence of particles is an indication that contaminants have entered the system or that certain components are wearing abnormally. Particles that are smaller than the minimum clearances could result in abrasive wear, which in turn causes premature aging or failure. Large particles could result in blockages of oil channels, which could lead to oil starvation. Thus, both conditions spell trouble to these role players. The main concern of the sampler is to produce a homogenous sample that is representative of the bulk volume of oil in the system. The presence of particles complicates the task of the sampler, as particles tend to settle at the bottom of the tank/sump. 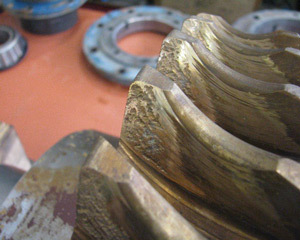 Prior to sampling, oil should be hot and well agitated to ensure that the sample includes particles that have settled. For routine oil analysis, the container must not be filled more than 80 percent to enable the laboratory to agitate the sample prior to analysis. Improper sample handling includes overfilling containers, decanting samples that were originally filled to the top and sampling when the oil has not been circulated sufficiently prior to sampling. Overfilling a container leads to insufficient agitation. Shaking the container prior to decanting will result in large particles remaining at the bottom of the container. There’s also the possibility that the less contaminated portion is decanted, causing the laboratory result to be higher than usual. Once the samples reach the laboratory, the presence of particles directs the tasks and methods that the chemical analyst will use to analyze the samples. 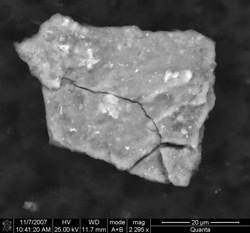 The method of sample preparation, the analytical techniques and instrumentation required to ensure that the results are representative of the condition existing in the application all depend on the type, size, properties and distribution of the particles present in the samples. Various analytical techniques, including inductively coupled plasma (ICP) spectrometers, the flow cell of Fourier transform infrared (FTIR) spectrometers and some particle counters, rely on peristaltic pumps and transport systems (tubing) to introduce samples to the various instruments. When large particles are present in samples, the possibility exists that the tubing could become blocked. Analysts also must be aware of the tendency of particles to settle at the bottom of the container. Prior to each analysis, samples should be agitated sufficiently to ensure a homogenous state. 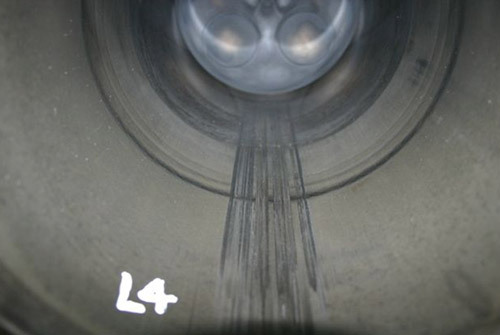 Lowering of the fluid’s viscosity either due to fuel dilution in the engine or dilution due to analytical requirements (e.g., ICP) aggravates the tendency of particles to settle. With ICP analysis, the samples must be diluted to assist with the transportation process. Due to dilution, suspended particles are more prone to settle out on the bottom of the test tube and will not be available for analysis. However, no dilution is required with rotating disk electrode (RDE) analysis. Particles can be of value to a diagnostician who studies the shape and nature of particles found in a sample. A scanning electron microscope (SEM) can assist in investigating the root cause of mechanical failure by allowing the diagnostician to pay special attention to evidence such as scratch marks on particles and methods of particle formation. Fine filtration is a proactive process aimed at removing contamination and wear particles from the system. If this process is not executed with special care, knowledge and sensitivity to the value that particles add for the diagnostician in root-cause analysis, crucial evidence can be lost. In 2002 the Eskom laboratory changed from ICP to RDE spectrometry to perform wear metal analysis on used oils. To obtain a new baseline, it was essential to perform both spectrometric methods as well as the ferrous particle quantifier (PQ) on all samples received for a three-month period. When the spectrometric results were plotted against the PQ values, it was determined that the higher the PQ value was for a sample, the greater the difference between the ICP and RDE results. 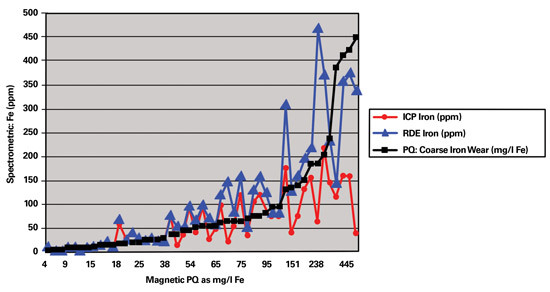 For a PQ value of 15 milligrams of iron per liter (mg/l Fe), the expected difference between the two techniques was about 0 to 5 ppm. However, above a PQ value of approximately 75 mg/l Fe, the relation seemed to become non-linear, where the differences between ICP and RDE results were from 50 to more than 500 ppm. as determined on samples of different sources. One sample with a PQ value of 1,712 mg/l Fe had an iron value of 699 ppm with ICP. The result on the RDE for this same sample was found to be in the region of 3,000 ppm. The difference in results obtained by the two spectrometric methods was as high as 2,300 ppm. When the wear trends of the unit with the PQ value of 1,712 mg/l Fe were examined, the ICP results gave the impression that the problem was either resolved or stabilized. However, when the RDE results became available, it was evident that there was an increase in wear. The final report recommended the unit be shut down for emergency maintenance. Due to the lower particle size limitation of the ICP, a plateau was reached much sooner than with the RDE. Applications most affected by the ICP’s lower size limitation were those that did not have internal oil filtration systems such as gearboxes and certain compressors. Geometry of the particles being analyzed by the RDE also affected the results. For example, if thin flakes of metal were present in the sample, flakes that had flattened out on the RDE gave a different reading than particles that had not flattened out. Thus, the results on the RDE varied due to the particle size as well as the geometry of the particles. The engine of a particular locomotive was replaced with a newly refurbished engine. When the engine was installed, the maintenance team had difficulty eliminating abnormal vibration in the engine. Eventually, it was determined that a bent flywheel caused the vibration. As soon as the vibration problem was eliminated, scratching noises were audible. Everything was checked, yet the source of this noise could not be traced. The maintenance engineer decided to involve the laboratory that performed the oil monitoring program in the investigation. Since the engine was recently refurbished and the original source was unknown, the laboratory had no history on which to base the diagnosis. To obtain more knowledge about the solid content of the oil sample, the lab employed specialized methods, such as the electron diffraction X-ray (EDX) scan technique using the SEM. To find out if the noise was due to insufficient lubrication, the laboratory determined the oil’s viscosity. 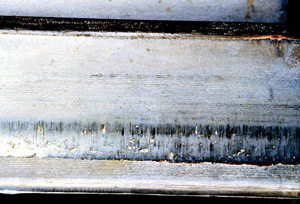 This was to establish if metal-to-metal contact had occurred as a result of the oil being too thin. A new oil sample of the specified lubricant was submitted for comparison with the oil sample taken from the engine. A PQ analysis was then conducted to determine the magnetic property of the oil, followed by spectrometric elemental analysis using RDE spectrometry. 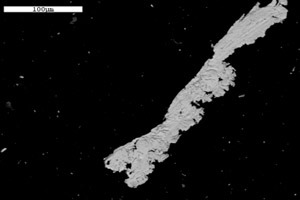 An EDX scan using the SEM was performed on particles caught after the sample was filtered through a 0.8-micron-filter membrane and rinsed with pentane to remove oil residue. The results revealed that the viscosity was acceptable when compared to that of the reference sample, while the PQ values were very high (more than 1,000 mg/l Fe). 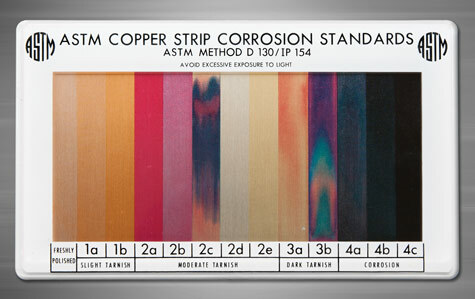 The RDE spectrometric analysis indicated an increase in copper, iron and zinc when compared to that of the reference sample. The available ionization energy to energize large particles reaches a plateau, which is one of the reasons different spectrometric methods have limitations concerning particle size (3 microns maximum for ICP and 8 to 10 microns maximum for an RDE spectrometer). Spectrometers, as they are applied today, are blind to large particles. Traditional methods of determining large particles (larger than 10 microns) are acid digestion (expensive and hazardous), microwave digestion (expensive and time consuming) and direct ferrography (does not include non-ferrous metals). 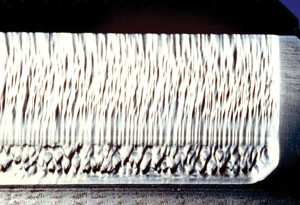 Rotrode filter spectroscopy (RFS) was developed to provide an improved spectroscopic method for analysis of used oils for condition monitoring/predictive maintenance without the particle size or metal-type limitations of previous combined spectrochemical and direct ferrographic techniques. 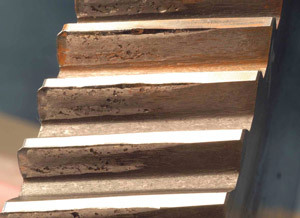 Special evidence, such as the scratch marks on the metal frets, suggested that uneven objects (particles) were responsible for abnormal wear of the liner and/or the crankshaft. The piece of silicone found indicated overuse of a silicone-containing substance like a sealant, which possibly was squeezed out between parts, cured and ripped off by the hot flowing oil. These silicone pieces could have blocked oil passages, resulting in a damaging situation of oil starvation. Particles including silicon (quartz) and sand (aluminum silicate) as well as other debris discovered in the oil sample were responsible for the abnormally high wear. Since abrasive wear was the main cause of premature aging and resulted in severe damage to the parts in contact with these objects, the maintenance engineer wanted the reason for the initial ingress of those particles into the system to be investigated. For the sampler, it was essential to ensure that as much evidence as possible was captured in the drawn sample. In this case, where the ultimate failure would have been catastrophic, the task could have been quite difficult, since all particles had settled to the bottom as the oil cooled. Thus, a typical sample drawn in the normal fashion may not have allowed all the evidence to be captured. By unlocking the treasure of evidence that was captured in the particles found in the oil, the diagnostician obtained information about the formation of such particles. 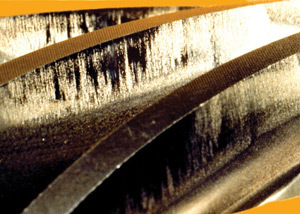 The presence of metal shavings indicated possible misalignment. Lack of lubrication also was detected, which possibly was due to blocked oil channels resulting from the presence of foreign particles. The metallic iron shaving with lead bound to it suggested welding due to oil starvation (metal-to-metal contact). The discovery of a particle with scratch marks led to an investigation of objects that could have been responsible for the damage. One possible culprit was detected in a particle consisting of calcium phosphate and calcium silicate. This specific mineral (possibly apatite) together with particles containing quartz and sand led to the conclusion that the engine originated from a locomotive that was involved in an accident with subsequent derailment where soil was introduced to the engine. Evidently, the soil was not removed successfully when the engine was refurbished. 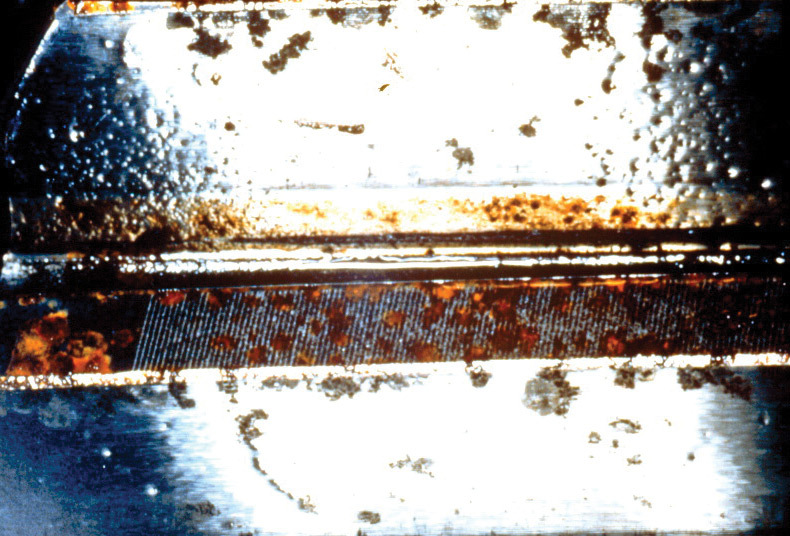 An iron shaving with scratch marks (top) and soil (above) were found in the oil sample. Prior to a wrist pin bearing failure, oil samples from a diesel locomotive were sent to two different laboratories for routine oil analysis. The first laboratory issued wear alerts on possible wrist pin bearing wear four weeks prior to the failure, while the second laboratory indicated no abnormal wear was taking place. A resample was taken, and again the second lab did not find any abnormal wear, while the first lab issued another wear alert. The fleet owner decided to stop the locomotive to find out whether the alerts issued by the first laboratory were justified. 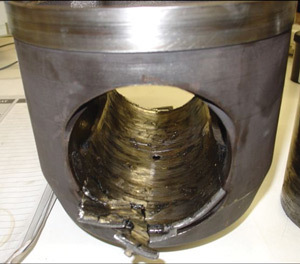 It was discovered that the wrist pin bearing had failed with damage to four power packs. An investigation was launched to determine the root cause that resulted in the different diagnoses from the two laboratories. Routine oil monitoring tests were performed, including spectrometric analysis using RDE spectrometry and PQ. 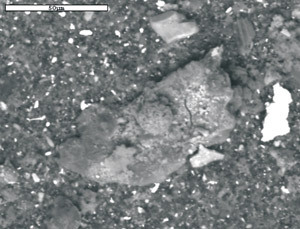 An EDX analysis using the SEM on the filter debris was conducted after the sample was filtered through a 0.8-micron-filter membrane and rinsed with pentane to remove oil residue. The results of the RDE spectrometric analysis revealed an increase in silver, copper and iron, while the SEM analysis confirmed the presence of particles larger than 10 microns. Since both laboratories performed similar analysis on a routine basis, the investigation focused on the differences in the techniques used by the two labs. 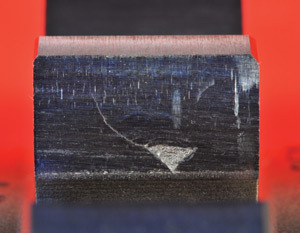 The only major difference found was that the laboratories employed different spectrometric techniques to determine the wear metal content of the samples, namely ICP and RDE spectrometry. reveal wrist pin bearing failure. The primary variation between the two techniques is the way the sample is introduced to the system. For ICP analysis, the sample is diluted prior to introduction to the instrument. Therefore, it’s possible that the particles settled prior to analysis. The ICP also uses a peristaltic pump and transport system, which is subject to blockages. In addition, the size limitation of the ICP is 1 to 3 microns, while the range of the RDE is 8 to 10 microns. 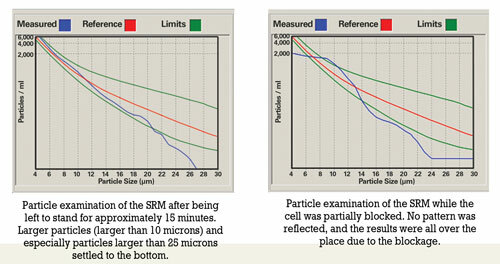 The SEM analysis confirmed the presence of particles larger than 5 microns, so it seems the failure progressed beyond the point where the ICP could detect the wear particles but remained within the range of the RDE. 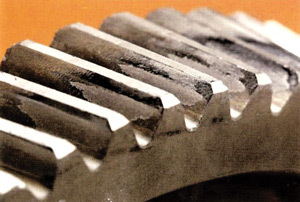 As part of an oil analysis program, the crankcase oil of a locomotive was monitored on a monthly basis. However, no samples were received for the period between January and the end of June. The engine failed at the end of September. The reason for concern was that all laboratory reports returned with no indication of an increase in wear metal content. 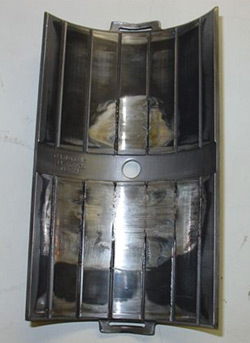 An investigation was initiated to explain why the laboratory tests failed to detect any increase in wear when it was evident that abnormal wear was taking place from the mechanical failure that occurred. Since no abnormalities were found except for fuel dilution over a prolonged period, the investigation focused on sampling intervals and techniques that could have affected the results. 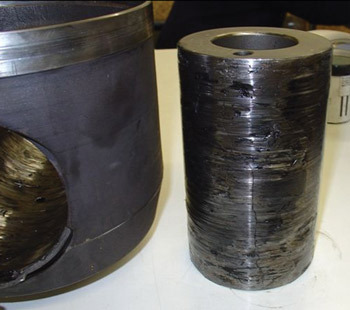 Routine oil monitoring tests, including spectrometric analysis using RDE spectrometry, were performed, as well as EDX analysis using the SEM on the filter debris after the sample was filtered through a 0.8-micron-filter membrane and rinsed with pentane to remove oil residue. The results showed severe fuel dilution. The RDE spectrometry indicated no increase in metal content since the previous sample was analyzed. The EDX analysis revealed that isolated large particles (larger than 20 microns) of heavy metals and other inorganic oxides were present on the filter. Many of the larger particles were iron or iron oxides. The small particles consisted mainly of calcium sulphate. These photos of a locomotive engine indicate a severely scored liner and piston wear. Lowering of the fluid’s viscosity, which may have resulted from fuel dilution in the engine, aggravated the tendency of particles to settle. Therefore, it is possible that suspended particles had settled to the bottom of the sump and were not included in the sample. In the earlier stages of failure, smaller particles were produced (likely during the period when no samples were submitted). As the failure progressed, the size of the particles increased. 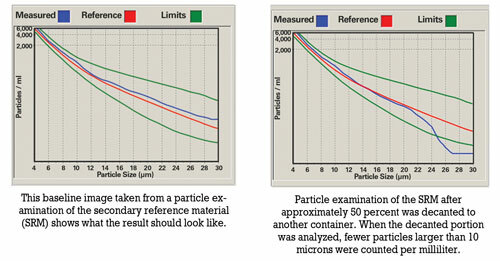 Since particles larger than 10 microns were found, it is possible that the failure progressed beyond the point where the RDE could detect the wear particles. Thus, severe fuel dilution over a prolonged period of time combined with not submitting oil samples at the initial stages of failure resulted in the inability to detect the failure through a routine oil analysis program. was found in the oil sample. In conclusion, it is apparent that removal of particles from a system prior to sampling by means of indiscriminate filtration, improper sample handling and settling of particles can result in the loss of important evidence that could lead to the early detection of possible failures or assist in root-cause analysis. Remember, the purpose of oil analysis is to avoid failure before it happens. Sensitivity with regards to particle sizes and size limitations of analytical techniques relative to sampling intervals is vital to reach this ultimate goal. In the end, the success of an oil analysis program to detect possible failure modes relies on the ability of the mechanical engineer, tribologist, sampler, analyst and diagnostician to treat and react to the presence of particles in the appropriate manner. An informative article I read on Reliable Plant Newsletter this morning. These days, best-practice contamination control is more like an accepted pre-condition for reliability. 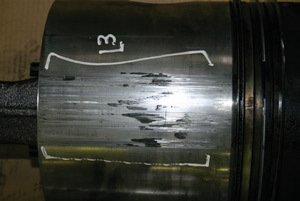 Given contemporary advances in technology for excluding and removing contaminants, it could be said that failure to control contamination is a failure of machine design rather than a failure of maintenance. A sugar mill was operating a fleet of more than 20 sugar cane harvesters. The typical fluid cleanliness of the hydrostatic transmission for the ground drive on these machines was ISO 22/20, and they were suffering regular pump failures - three pumps per machine, per season, on average. The sugar mill contracted a local hydraulic engineering firm to investigate the recurring pump failures. They recommended a specification change to the ground-drive hydraulic motors and an upgrade of the filtration. One machine was modified as a prototype, and after showing promising results, two more machines were modified in the first season. The ISO cleanliness code on the three modified machines was 18/15 or better. By the fourth year, 15 machines had been modified. The mill was now changing out one variable piston pump per machine every three seasons - a nine-fold increase in pump life. Armed with this data, the sugar mill convinced the cane-harvester manufacturer to incorporate the same transmission and hydraulic filtration design at the factory. This is not a scientific study into the benefits of improving fluid cleanliness alone, because clearly, other changes were made to the hydraulic circuit in addition to upgrading the filtration. We’re also not told what influence (if any) these modifications had on other important operating parameters such as pressure and temperature. But what can’t be disputed is the drastic improvement in pump life. As a result, the equipment end user demanded that the machine manufacturer improve the specification (and initial cost) of the equipment they were purchasing. Of course, this was after the economic benefits of doing so had been clearly demonstrated to the end user. For this hydraulic equipment owner, it was a case of “I once was blind, but now I see.” Prior to this education, they likely would have looked at two cane harvesters of similar capacity from competing manufacturers and bought the cheapest one - with little or no regard to machine reliability or life-of-machine operating costs. There are two important factors for hydraulic systems that can help you set target cleanliness levels. One is how sensitive the components are to contaminants. This is called contaminant tolerance. The second factor is pressure. There is a disproportionate relationship between pressure and contaminant sensitivity. Basically, the greater the pressure, the far greater the contaminant sensitivity the components have to contamination. After you have considered the component type and the pressure, also consider the duty-cycle severity, the machine criticality, the fluid type and safety concerns. All of these factors collectively can be used to set target cleanliness levels in hydraulic systems. Even though they got it the wrong way around, this machine owner got it in the end. If you’re a hydraulic equipment buyer/owner, the key takeaway of all of this is that the best time to consider these issues is before you purchase a piece of equipment. By starting with the end in mind, you get the maintenance and reliability outcomes you desire - before the machine even gets delivered. Like in the cane harvester example, you specify the contamination control targets you want to achieve based on your reliability objectives for the piece of equipment and instruct the manufacturer to deliver the machine appropriately equipped to achieve these targets. Based on the weight and viscosity index of the hydraulic oil you plan to use, you determine the minimum viscosity and therefore the maximum temperature at which you want the machine to run. You then instruct the manufacturer to deliver the machine equipped with the necessary cooling capacity based on the typical ambient temperatures at your location, rather than accepting hydraulic system operating temperatures dictated by the machine’s one-size-fits-all designed cooling capacity - as is the norm. For example, say you are about to purchase a 25-ton hydraulic excavator that is fitted with brand “X” hydraulic pumps and motors. According to the pump manufacturer, optimum performance and service life will be achieved by maintaining oil viscosity in the range of 25 to 36 centistokes. You also know that in your particular location that you expect to use an ISO VG 68 weight hydraulic oil, and the brand of oil you are already buying has a viscosity index of 100. This being the case, the pump manufacturer tells you, based on the viscosity and viscosity index of the oil you plan to use, that if your new excavator runs hotter than 70 degrees C, the performance and service life of the pumps and motors will be less than optimum. Not only that, with 70 degrees C as the maximum operating temperature, the oil, seals, hoses and almost every lubricated component in the hydraulic system will last longer. 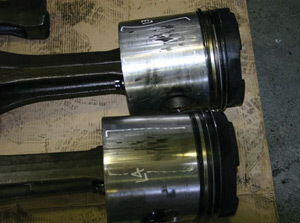 You could continue by specifying other requirements that have an impact on hydraulic component reliability, such as that all hydraulic pumps have a flooded inlet, that no depth filters or screens be installed on pump intake lines and that no depth filters be installed on piston pump and motor case drain lines. At the very least, as the cane harvester story demonstrates, the next time you or the company you work for are purchasing hydraulic equipment, be sure to define your fluid cleanliness and operating temperature/viscosity targets in advance and make them an integral part of your equipment selection process. In the world of process plant, redundant system is being installed. Equipment such as PLC or Control System runs on a full time online fall back redundancy system. Whereas most mechanical equipment runs on a variety of duty-standby arrangement. In my view, the most effective duty-standby arrangement has to be judged by the engineer. The question to ask is, what is the dominant failure mode. If it is a random failure mode that is dominating, there is very low risk of increase of failure for switching them every fixed period of time. If the dominant failure mode is in the realm of wear, then one might want to consider off-setting the operational hours so they don't have a perfect storm resulting in plant downtime. If the dominant failure mode is false brinelling, one might want to consider running all the redundant equipment at partial load instead!